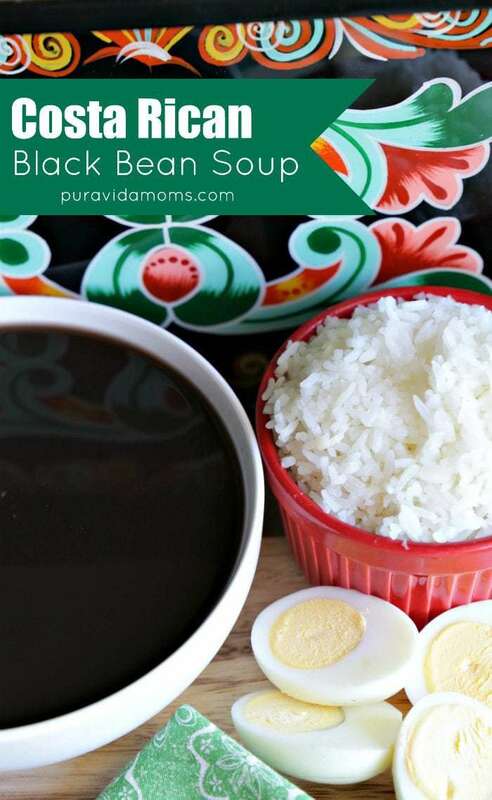 This traditional Costa Rican black bean soup recipe is a delicious, healthy, and simple vegetarian meal that everyone loves! Served with white rice and Salsa Lizano, you can find this dish on most Costa Rican restaurant menus as well. Black beans are one of the cornerstones of Costa Rican cooking, and there are a myriad of delicious recipes. We started making more types of black bean recipes when our girls were learning how to eat solid foods, as both of them really loved black beans, and I think they are super easy to prepare. 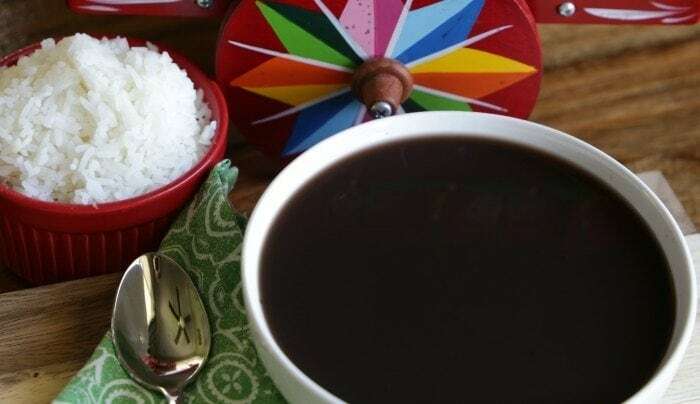 What Is Costa Rican Black Bean Soup? 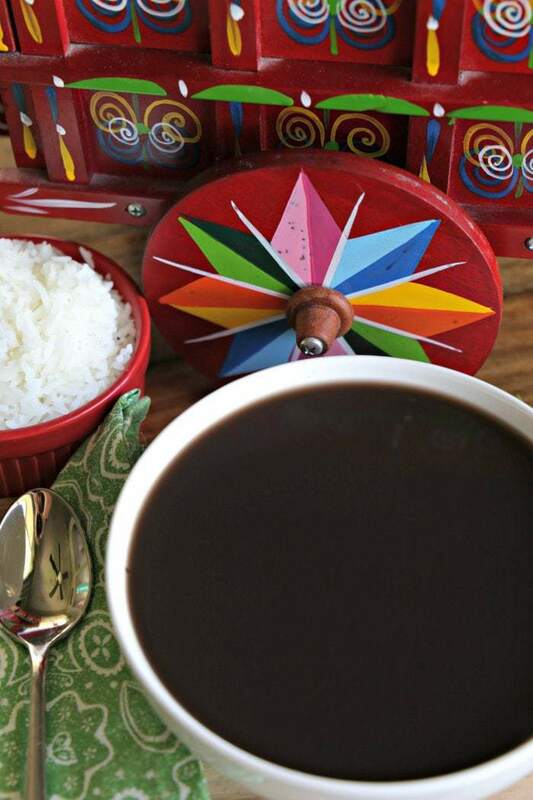 One of our favorite recipes is the Costa Rican Black Bean soup, or Caldo de frijol. Since most Costa Rican homes have a pressure cooker, the black beans are most often prepared fresh in the morning so they’ll be ready for lunch or dinner. But those recently cooked black beans smell so delicious that it’s hard to wait to eat them until mealtime- which is how I suspect black bean soup was invented. It was made into a meal, then, by adding a hard boiled egg. Apart from being a staple in most Costa Rican home cooking, you can also find caldo de frijol on most menus. The manner in which the soup is served varies, however. The way we serve the meal is to put white rice and a peeled hard boiled egg in a bowl, and the cover them with beans and bean broth. However, some restaurants only sell you the bean broth and white rice with no beans or egg. Or other places sell you the broth, beans and egg with no rice. You get the idea. I have found Costa Rican kitchens to be very accommodating when we order the dish, so just ask for what you want and then will do the best they can. This dish is easily prepared in the slow cooker, but I prefer to use the pressure cooker or Instant Pot because the meal is ready in about a half hour. I generally get the beans started, then start to boil the eggs, and finally make the white rice in traditional style. My husband often comes home for lunch and craves a freshly made soup, and this one fits the bill. It’s also a very economical recipe that fills you up fast. The soup is traditionally served by removing the big pieces of cooked vegetables before serving, but we love to eat them too, so I just leave them in the soup. We love this recipe here at Casa Pura Vida- and I hope you do too! If you are looking for similar dishes, try these! Place all ingredients in slow cooker and stir lightly. Cook on low for 4-6 hours or on high for 2-4 hours. This is also a great Instant Pot recipe, can made in the pressure setting on high for 25 minutes. While the soup is cooking, hard boil desired number of eggs and peel. To serve- remove large pieces of vegetables (optional) and place black beans in a fairly large bowl. Add one egg per serving. Cover the beans and egg with broth. Serve hot, with Salsa Lizano and white rice for garnish.